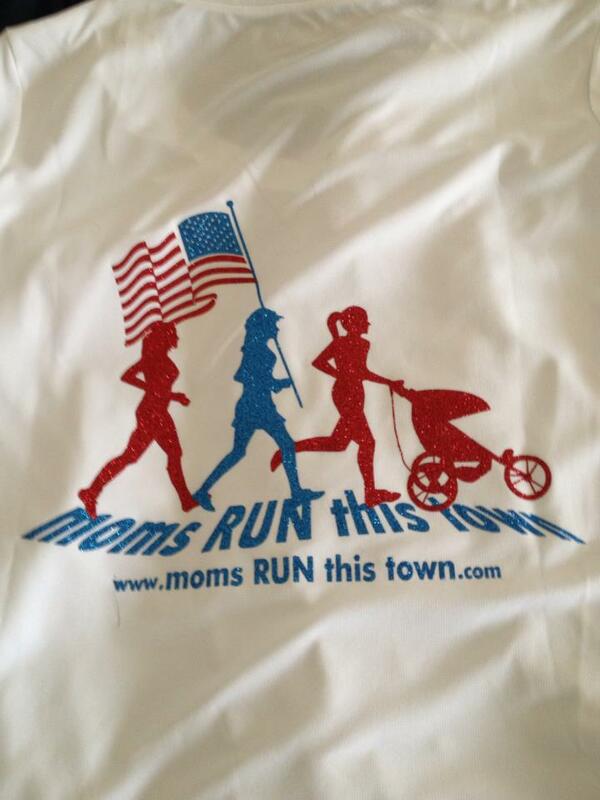 My long-term goal for this year is to run the Marine Corp Marathon (aka “The People’s Marathon”) in October. Last year, it took just under 3 hours to fill the race. While there were still slots to be had with charity groups, my dismal attempts at fundraising for the MC 10K made it quite clear that I needed to get in on the early registration! Why any large races continue to use Active.com is beyond me. 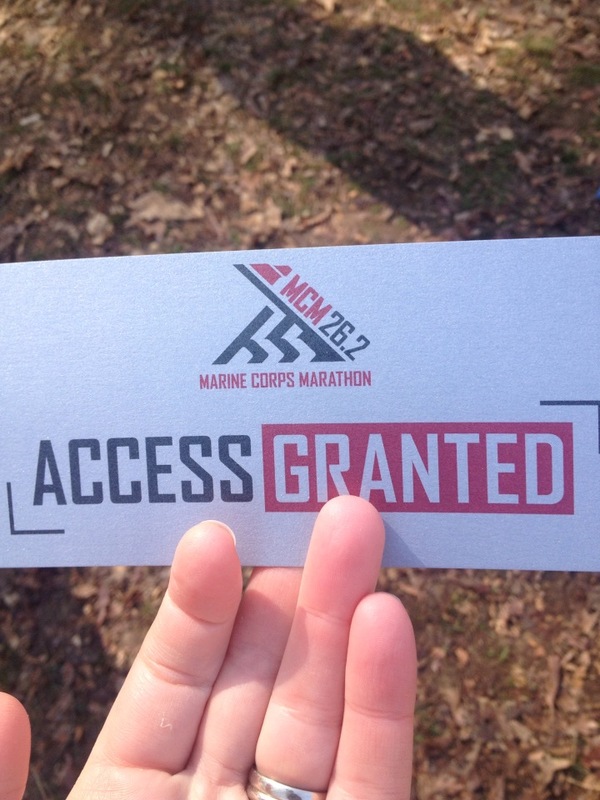 With this race being the “golden ticket” where finishers were guaranteed entry into the MCM, I knew the slots would go fast and I wasn’t wrong. There were some moments of stress when Active kept crashing but I finally did secure my spot. The race sold out in just a few hours. Racers were given the option of picking up their packet on Thursday at VA Runner in Woodbridge or at Quantico on Friday. There were also some packets being picked up at the start line. We decided to go on Thursday and were at the running store right when they opened at 10 so there wasn’t much of a line. I picked up my bib and the very nice, long sleeve, technical shirt. We were given a clear bag for our stuff but I wasn’t sure if it was for bag check or what. At the 10K, we had a label with our bib number to stick on our bag if we were checking it. There was no label so I decided not to check anything rather than risk loosing (Foreshadowing – bad move!) 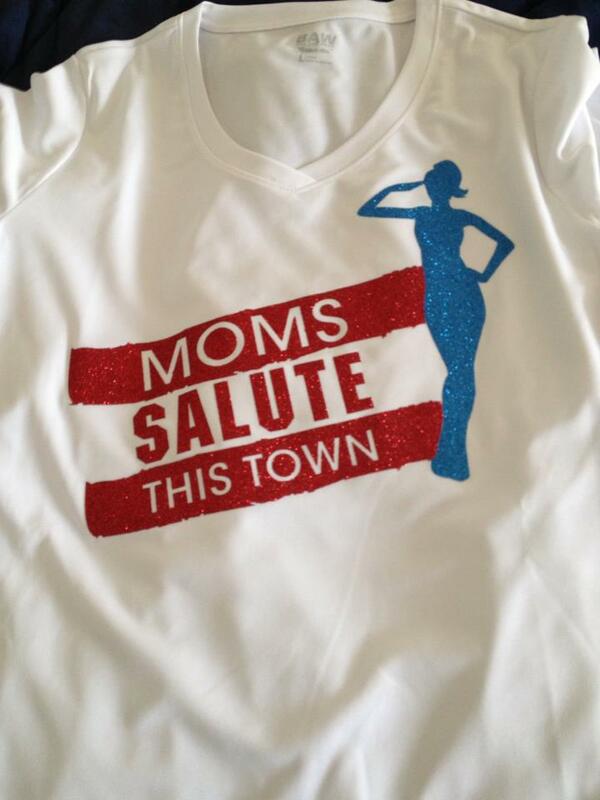 I also picked up my shirt that I bought as part of Moms Run This Town running groups. Runners were instructed to park at the commuter lot in Quantico Corner. I didn’t scope out the location earlier so I just followed directions. It was pretty cold that morning (low 30s) so I hung out in the car for as long as I could where I drank some EFS and ate a Mac Attack. 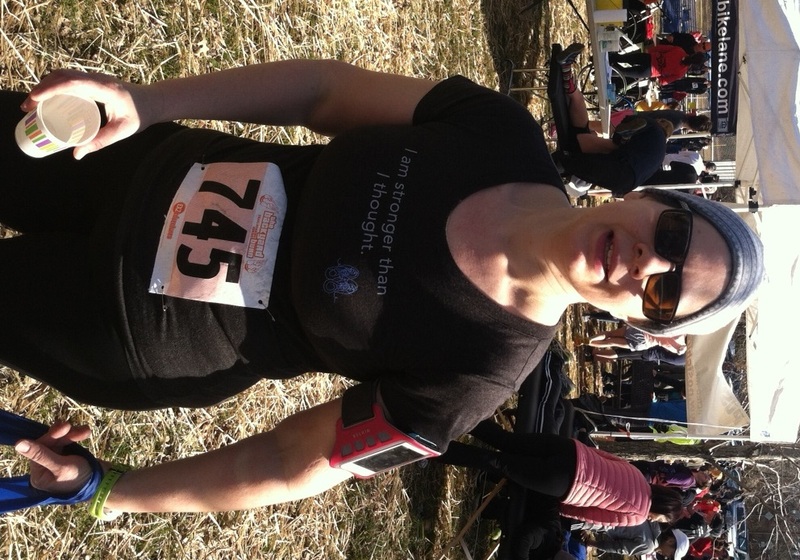 I wore a long sleeve shirt, my MRTT race shirt, long pants, wools socks, beanie, gloves. I also wore a sign recognizing my nephew for his service in the Marine Corp. He is newly deployed, newly married, and has a baby on the way so I dedicated the run to him. At 7:00, I loaded the bus and we rode over to the small shopping plaza that was serving as the start. It turns out that there was plenty of parking at the start. This was not a spectator friendly course so there were mostly just runners milling around. I met the MRTT runners for our group picture and then hit up the pancake restaurant to use their facilities rather than suffer through the freezing (and too few) port-a-johns. Just before 8:00, the invocation was given and the Star Spangle Banner was sung and then we were off! The first three miles were along a pretty busy road and we only had use of one lane and the paved path off to the side. I stayed on the path when I could so I didn’t risk being hit. We then turned into the Prince William Park where we ran on a trail for a bit before joining the paved (and closed) park road. The only spectators were the Marines who were the Course Marshals and the volunteers at the water stations. They tried to make up for the lack of faces by cheering and giving out plenty of high fives. There were also “demotivational” posters along the course such as “Is that all you’ve got?” and “No, you are NOT almost there!” which I found pretty amusing. There were plenty of the promised “rolling” hills and some that there were killers. The downhills were a blast and the woods were very pretty. Some of the course ran along a nice stream and I enjoyed the sights and sounds along that stretch. What I did not enjoy was the last mile! It was a trail that was pretty steep (up and down) with very deep and loose stone. I was worried about twisting something so I just took that nice and slow. I finished in 2:09:59. I could have taken about 7 minutes off from that time but I was treating this as a training run so I didn’t want to kill myself. I was happy with my time and effort. After crossing the finishing mat, we had to queue up and work our way up another steep hill for the water, fruit, bagels, etc. I then wandered around the finisher area and waited in line for a while in what turned out to be the beer line. I finally found what I wanted – the tent where I turned in my ticket for the MCM access pass and the race’s Warrior Chip. I then decided to head for the bus line but first grabbed two Muscle Milks on the way. I had to wait for an hour for the bus where I became extremely cold and stiff. I was kicking myself for not checking a jacket!! I also drank both Muscle Milks because I didn’t know when I’d ever get back to the car. I paid for that with a migraine the next day. I learned to always check a bag with extra clothes and food when I run without my “support team”. Most of the course was pretty. It wasn’t too crowded (only 2,177 ran it). The shirt was very nice. Getting the access pass for MCM and registering with ease on Saturday was priceless. Yesterday I attended a clinic hosted by Tri It Now. It was held at the lovely Freedom Aquatic and Fitness Center which is located on the George Mason Manassas campus. The clinic covered the following topics: run, swim, bike, nutrition, training, transition. The topics were presented by two long-time triathletes and coaches. If I had not just attended a running clinic a few months ago, I may have gotten more out of this session. We discussed proper running form and gear inside and then went outside for a warm-up run and to practice our cadence. The average cadence is 160 per minute, top athletes are 200+ per minute. I started at 168 and was able to push it to 183. I think I may start running with a metronome app on my phone so I can practice the higher cadence. There are a lot of articles about improving your running cadence online. They say that you are able to work less and run faster with increased cadence. I’m skeptical but I’ll give it a go! This was, by far, the most challenging part of the day for me. I will write more tomorrow about why. In this section, we practiced about 6 drills including swimming on just one side and swimming with a kickboard held between our legs so they could check our rotation. It was a long and tiring workout for me but it was a huge help since I’m not a terribly strong swimmer. They said my form was good and that I should just keep practicing the drills. Another bonus is the fact that the clinic was held at the same location as my May event so I now know the pool. That is a big psychological boost for me! In the bike portion, we mostly discussed various equipment and we practiced changing a tire. 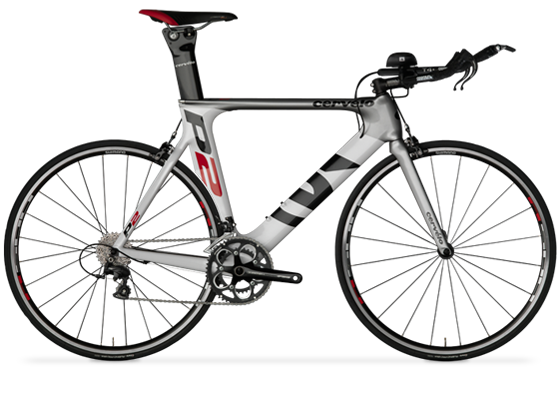 It helped that the race director brought her Cervelo that is a kissing cousin to my borrowed bike so I was able to ask some questions about that particular bike and just look at it for the day. And, okay, I honestly caught myself thinking if she can ride in aero, so can I! I got the least from these two sections. They didn’t cover anything that a million training books don’t cover every single time. Though, one participant did ask questions so maybe it was new to someone?? It was a long day and they got off into the weeds a bit but I think it was well worth my time. The more I can expose myself to the various multi-sport concepts, the better. And, having a real swim coach help me for an hour was invaluable. If you are considering multi-sport, I highly recommend attending a similar clinic. Many Tri groups/organizations host them and it is a good way to get a better feel for the sport before you start buy a ton of gear or logging a million miles. 1. I wear the right shoes and I buy new ones on a regular basis. When I first started the Couch to 5K program, I bought a pair of New Balance shoes that were on sale at Amazon and called it good. They worked fine for the program but by the time I ran my first 10K, I knew I needed better support. I went into my local running shop where they analyzed my gate and helped me select the right pair for me. I was super nervous about going the first time because I didn’t really consider myself a runner but I used the high of my first 10K to get me in the door the same day. Of course, my worries were for naught and they were super friendly and helpful. I now wear the Saucony Ride 5. I was a bit surprised that they had me go up an entire shoe size from my street shoes but my toes never rub and I haven’t lost a toenail yet. 2. I do strength exercises. I do squats, lunges, etc. on a regular basis to help balance out my leg muscles. There are a lot of different leg exercises you can do. You should be able to add this into your cross-training with no problem. 3. I drink bone broth every day. The gelatin in homemade bone broth is excellent for joints. You can find a whole slew of benefits to bone broth if you just Google around a bit. I swear that I can tell when I miss a couple of days! I also think it greatly aids my recovery. Set to a low simmer (just a couple of bubbles in the middle) and let it cook for as long as you want. I usually put mine on either first thing in the morning or right before bed and let it go on the #2 setting of my electric cook top for 12 hours. Strain out the chunks and refrigerate. You can salt and pepper your individual servings as desired. I may not be able to hide from knee problems forever but I plan to avoid it as long as possible! In 30 days I will be running my first half marathon! I’ve got this! I’m not (overly) afraid of the distance any longer. I was kidding in my post about the trail race but, seriously, if I can do 10 miles of THAT, then I can definitely do 13.1 flat, paved miles! Now that the distance is no longer a looming monster, I need to pick up my pace. Literally. I maintained two 10 minute miles and one 11 on the treadmill this morning. I’m shooting for three miles at 10 next time. I don’t have any major time expectations for my first half but I would love to do better than an 11 min/mile average. My long term plan is to do a sub 2 hour half but I know it won’t be this time around. That’s okay. I can wait for it. In other news, I’m doing my first obstacle run in June. Time to start working on the upper body! I think I need to have my husband install a pull up bar for me in the family room. Until then, I’m going to embarrass my kid on the monkey bars at the park. Good times! Yesterday I ran my first trail race, my second ten miler, and my third trail run at the same time! 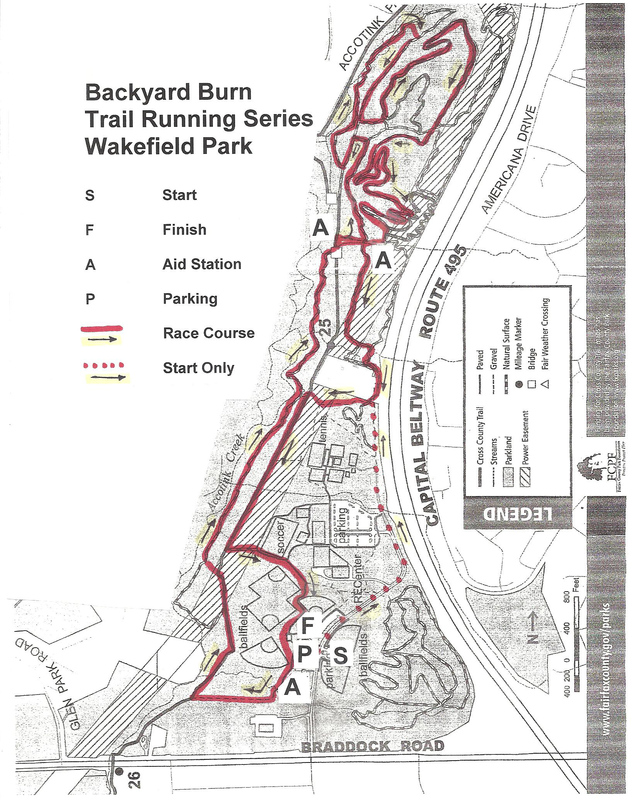 I participated in the EX2 Adventures Backyard Burn race series. I chose the Wakefield race as the description said it was the flattest of the series. Since this was to be my first trail race, I decided to volunteer with them for the first race of the series last week. I think this was a very good move on my part! I was able to see how things operate and the organizers remembered me so I had some additional friendly faces to cheer me on. I must say, though, I was feeling a bit nervous because the runners who came in to my aid station at mile 7 last week looked ROUGH! But, this was to be the flattest course so I was hopeful. Note to self, zig-zag lines do not equal a flat course! It was super easy online registration. If you sign up for the entire series, you get a discount. The individual races are pretty cheap, though, and you can save the online fee by mailing in a hard copy. The races do sell out so you can’t really wait until the last minute. The packet pickup was a breeze and the race shirt (one per racer per series) was very cute but the women’s cut was super small. I was glad that I was able to switch out for an XL. It was a bit chilly waiting for the start but it was to be a clear, sunny day with little wind so we knew it would warm quickly. I wore a couple of layers while waiting and then just a short sleeve shirt, long pants, smart wool hat, and gloves to run. The gloves were tossed under a tree at the start of the second lap but I kept the hat on the entire time. My hair was soaked and I didn’t want to get too cold in the woods. I also wore my older Saucony’s and wool socks. At 8:50, we all gathered for a pre-race briefing. It was a quick overview of the course and some basic etiquette reminders and a reminder to not use headphones. We then took to the road for the 1 mile prologue which allowed us to find our pace before being forced to single-track trails. I self-selected to the very back and I think that was a mistake. I was stuck with a pretty slow group and I feel like I burned out a bit by maintaining such a low speed. Also, the other ten milers were at the front of the pack so I was pretty much alone once the 5s stopped and I kept on for my second lap. It wasn’t terrible, though, because I was able to enjoy the run a bit and listen to the river, birds, and spring peepers. 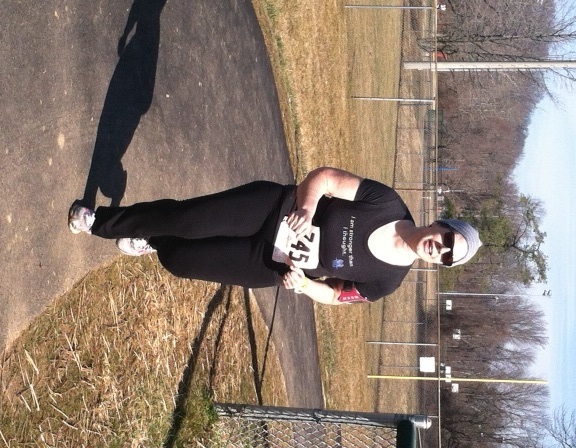 The course itself was a 4.5 mile loop that I ran twice. There was a small bit of road (cinder and dirt rut) and stone (which I hated because they were very uneven), but mostly dirt trail. We crossed four streams that were mostly easily jumped but one did catch me on the second loop and I had a wet foot for a few miles. It was a bit muddy in spots – especially on the last time through – and we also had to go over several downed trees and little bridges. The switch-backs up the hill were challenging but what really got me was coming down the relatively steep cinder road at the start of mile 9. By that time, my knees would have NONE of it and I wound up walking rather gingerly down. The woman who had been playing leap-frog with me wound up pulling ahead and finished about a minute before me. Final push. 10 miles of trail = 15 miles of road, right?? I think I finished 4th to last. Eh, that’s okay. I still had fun! Everyone was so great, even the other runners. I tripped on a root (the same one on both laps!) and everyone ahead and behind called out to make sure I was okay. The on course support was good with 3 aid stations – which I passed 6 times – with water and Gatorade. They had gels last week but I didn’t see them this time. There was real food (pizza, breakfast burritos, etc.) at the finish line but I stuck to Sprite and a banana. There were some nice give-aways and a little something for the kids. It’s a super family-friendly group and I’m glad my husband and Little Runner came back early and hung out while I was coming down that freaking hill. The sponsors were very good and my chiropractor’s office had a tent set up for adjustments and massages. A nice touch for a small race! Overall, it was a great day and I would definitely do it again! Next up, the Marine Corp 17.75K. Yeah, baby! Today was a “snow day” for the DC metro region. “Slush day” is more like it but who am I to look a free day off in the mouth? It was also a day that I was scheduled to run 7 miles. This is my last big mileage week before I begin a slow taper. Guess how many miles I ran. 0, nada, zilch. What did I do instead? I made an excellent breakfast for my family, took my son to Target for a new Lego set and spent a few hours building and playing with it, watched the last Star Wars movie that we never seem to have time for, and had a low-stress dinner before a lengthy bedtime story session. Do I feel bad about falling off plan (again)? Not really. I want my running, etc. to be a positive thing for my entire family and I think a snow induced mental health day was the perfect move. The road will always be waiting for me but days like today are truly fleeting. What about you? 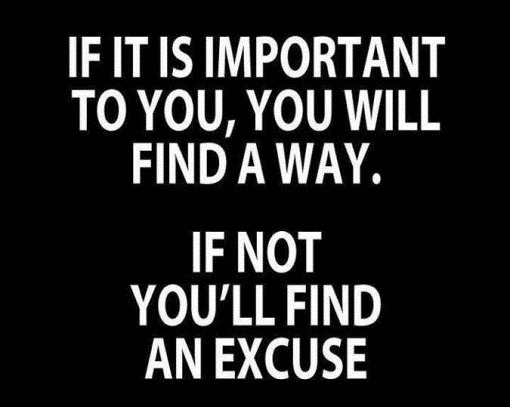 Do you stick to you plan religiously or is there some wobble to it? Do you think anything suffers because of it? 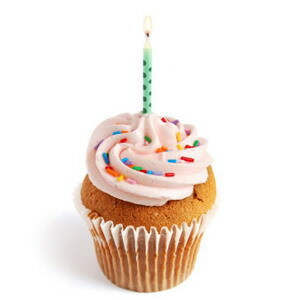 Today is my “runniversary”. 1 year ago today I began day one of the Couch to 5K program. Of course, on that day, it was more a brisk walk than a run and it would take many weeks before I could run faster than that walk but I stuck with it! I don’t have the best track record when it comes to exercise programs so I think I surprised everyone by not only finishing the C25K program but continuing on with my running. I still don’t know exactly what pushed me over the edge and made me lace up my shoes for the first time. I think I was finally, officially, fed up with being fat, sick, and tired all of the time. 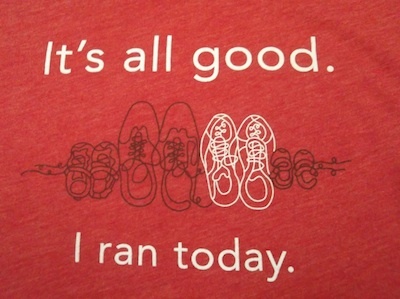 Running has not only improved my health but it also sparked a “let’s try it!” attitude. I’m finding myself signing up for all sorts of “crazy” things that I would have never had the temerity to attempt even a year ago. Seriously, kickboxing? Triathlons? Who is this crazy woman? I don’t know but I’m glad she’s sticking around! I decided to switch out my long run to Saturday this week. I was scheduled for 10 but only did 8 before my bladder effectively halted my last 2 mile loop past the house. I was a bit disappointed by my performance and the fact that I didn’t stick to my plan. My husband had to get after me a bit and remind me that I still ran 8 MILES! That’s an accomplishment! I’ll get the 10 next week. Speaking of next week – long runs scare me, mentally. I know I can do it but I habitually talk myself out of them. I have found that I cope much better in a group environment, even if I don’t end up running with the group. To that end, I signed up for a 10 mile trail race next Sunday. Since I’ve only done a couple of trail runs (2), and never a race, I decided to volunteer for the first one of the series on Sunday. I’m so glad I did! Apparently, this is the most difficult course of the series. As I was working the aid station, it was very interesting to see the difference in the runners between their first loop and the second! The first loop had the runners pretty tightly bunched and everyone was very peppy. The second loop, 5 miles later, was much more spread out and it was clear that some of the runners had taken the “quick” way down some hills based on the amount of dirt on them. They all seemed to have a great time, though, even with the cold. It was nice that most of them stuck around to cheer in the later finishers. In a road race, everyone tends to clear out as soon as they are done. I tell you, though, there are very few tasks as cold as filling and handing out water and Gatorade for 2 hours. In the woods. In 30 degree, cloudy, weather. With wind. Oof. When I came home, I climbed into bed fully clothed and passed out for an hour! Next week’s course is not supposed to be as challenging – no mention of “some hills” in the course description. I’m looking forward to running it! I’m “looking forward to running”! That still shocks me, even a year later. My training is really ramping up for my first half next month. My weekend “long” runs are now 11-13 miles and I have Wednesdays of 6-7. I’m not terribly speedy so that’s a good chunk of time spend on the road/trails/treadmill. Throw in 2 nights of kickboxing, 1 night of TRX, plus 1 night of swim classes (I need to learn how to lane swim!) for my impending mini-tri and, well, more than my abs are feeling crunched! At the end of the day, though, I still think I’m coming out ahead. Just don’t mind me if I fall asleep mid-sentence.